E3 2014 games impressed all audiences as companies concentrated on boosting their next generation game consoles. Video game companies aimed to put everyone in the game realm at this year’s Electronic Entertainment Expo (E3) at the Los Angeles Convention Center (June 10 through 12) featured several games coming before the end of the year and beyond. High profile titles, independent gems, adaptations/reissues, and handheld offerings all boosted Sony, Nintendo, and Microsoft at this year’s Electronic Entertainment Expo. Check for your favorite franchises, and see which titles you will have in your holiday shopping radar. NOTE: All E3 2014 games release dates subject to change. Konami’s Metal Gear Solid V: Ground Zeroes primed gamers for the second part of Snake’s latest adventures Metal Gear Solid V: The Phantom Pain. 2K’s Evolve (Oct. 21 on Xbox One, PlayStation 4 and PC) has a “man vs. nature” / four hunters versus one monster action format. The highly anticipated sci-fi space shooter Destiny hits the PlayStation 3, PlayStation 4, Xbox 360, and Xbox One on Sept. 9 and is featured in a special bundle with a glacial-white PS4. The upcoming space exploration game No Man’s Sky also looks to be a big hit. The colorful Sunset Overdrive (Oct. 28) mixes Tony Hawk-like stunts with fantastical firepower amid a familiar, but apocalyptic world. This action mashup has already turned heads, but we’ll see if it turns the video game world. Assassin’s Creed Unity lets three friends play together under one brotherhood and will be available for the PlayStation 4, Xbox One and PC on October 28. Madden NFL 15 (standard and ultimate editions) will showcase defense and feature better AI on August 26. Battlefield Hardline (Oct. 21) takes the fight to a crime world with players taking the police or criminal side on Xbox 360, Xbox One, PlayStation 3, PlayStation 4 and PC in standard and deluxe editions. UbiSoft’s The Crew (Nov. 11) has an amazingly large, coast-to-coast United States environment in a racing action format on PC, PS4 and Xbox One while Sony’s Drive Club was not featured much at E3, but still hits the road on October 7. HALO: The Master Chief Collection (Nov 11), will include the entire saga plus 1080p graphics and over 100 multiplayer maps. HALO 5: Guardians BETA will be available in December 2014 and HALO 2 will also get an anniversary edition. PlayStation 4 exclusives include The Last of Us Remastered (December) in standard, digital bundle and survival editions. Captain Toad: Treasure Tracker (Holidays) branches a character off the Mario game series on the Wii U while Dragon Age: Inquisition (Oct. 7) boasts more than 40 “major endings” in the story. Happy 30th birthday Tetris! …and to celebrate UbiSoft packs in Tetris Ultimate this summer on Xbox One and PlayStation 4 (PC in the fall) in 1080p and running at 60fps. This famous puzzler game will have six different game modes: battle, endless, marathon, power-up battle, sprint, and ultra. 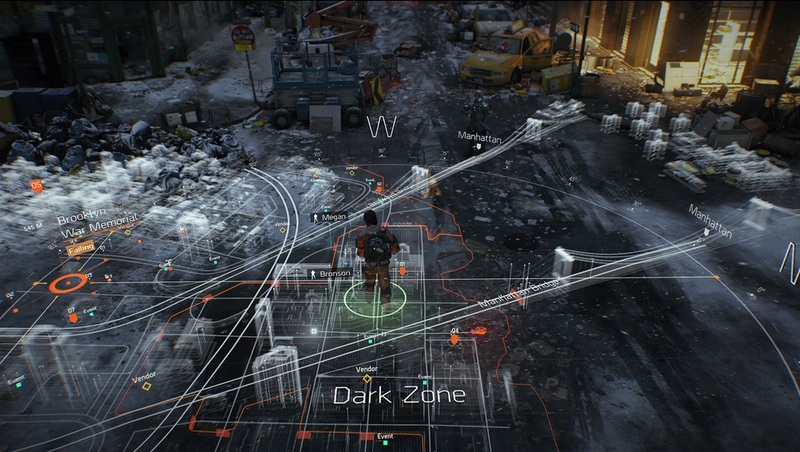 Tom Clancy’s The Division from UbiSoft has an impressive action showcase set in a post-pandemic New York with incredible map interfaces. Other notable games coming soon include Middle-earth: Shadow of Mordor (Oct. 7), Alien: Isolation (also Oct. 7), Lego Batman 3: Beyond Gotham (Nov. 30) and Grand Theft Auto V, which will hit next-gen consoles (except the Wii U) and PC sometime in the fall. FIFA 15 and The Sims 4 will be heavy hitters on multiple platforms this fall. Farming Simulator 14 (June 24) comes to the handheld Nintendo 3DS and PlayStation Vita where players will and raise livestock (cows), grow crops, sell produce and manage and develop your own farming complex. Nintendo’s Amiibo interactive figure toy line was a huge “toys-to-life category” announcement. These figures contain a computer chip to be used with the Wii U gamepad (similar to the Disney Infinity and Skylander lines). Announced games compatible with the Amiibo included Mario Party 10, Yoshi’s Woolly World, Super Smash Bros for Wii U, Captain Toad: Treasure Tracker and Mario Kart 8 with more on the way. The initial launch this winter will include approximately 10 figures, which will also evolve in gameplay and a Nintendo 3DS peripheral is also on the way. Disney Infinity 2.0 will include a trio of Ms – Merida from Brave, Sleeping Beauty’s villain Malecifent and several Marvel super heroes. Nyko will have more hardware and peripherals the Xbox One and PS4 including charge sets and an intercooler that does not require additional cables or plugs. The latest The Last Guardian news (first announced in 2009) is that the game is still in development while Final Fantasy Type-0 HD, a remaster of a 2011 action-role-playing game for the PSP in Japan will be coming to Xbox One and PlayStation 4 (not on PS Vita) in North America and Europe. Xbox exclusives include Fable Legends (in beta now), Dance Central Spotlight, the musical motion-filled game Disney Fantasia: Music Evolved (Oct. 21) and Scalebound, a shooter that gives players the advantage by adopting special creature/animal powers. The PlayStation 4 exclusive The Order: 1886 will release on Feb 20 in standard, collector’s and premium editions. Nintendo has several Wii U exclusives on the way including Devil’s Third, Bayonetta 2 (packaged with the original, Oddworld: Abe’s Oddysee – New ‘n’ Tasty, Pac-Man And the Ghostly Adventures 2, and Xenoblade Chronicles X plus Fantasy Life, Pokémon Omega Ruby and Alpha Sapphire on the 3DS. The Wii U exclusive Hyrule Warriors will be Legend of Zelda spin-off / collaboration game with the Dynasty Warriors game series will feature multiple and simultaneous battles in an HD, open-world environment for the Wii U plus a two player mode. Mario Maker will let players create and revise 2D levels of the popular platformer, including 8-bit levels. The clay-styled Kirby and the Rainbow Curse and Pac-Man And the Ghostly Adventures 2 were announced for Wii U and 3DS. Gamers can look forward to these offerings in 2015: EA Sports PGA Tour, Star Wars: Battlefront, open world shooter Homefront: The Revolution and the next Mass Effect. Lara Croft got two new game announcements – Lara Croft and the Temple of Osiris (PS4, Xbox One and PC), a sequel to Lara Croft and the Guardian of Light, with four player co-operative gameplay from a third-person/”top down” perspective and Rise of the Tomb Raider the continuation of the recent next-gen reboot. Rainbow Six Seige, Mirror’s Edge, Far Cry 4, Crackdown, Batman: Arkham Knight, Mortal Kombat X, Uncharted 4: A Thief’s End and Witcher 3 Wildhunt led the upcoming action game assault. Style seekers and players seeking unique games can look forward to the underwater adventure ABZU, Ori and the Blind Forest from Moon Studios and side-scrolling puzzler Inside. Wii U exclusives coming in 2015 include the space adventure Star Fox, open-world The Legend of Zelda and the family fun paintball-type shooter Splatoon. This shooter game has two teams of four battling to control territory and gameplay will stress special properties depending on which color players move through. Upcoming 3DS games include Monster Hunter 4 Ultimate, Persona Q: Shadow of the Labyrinth (Nov. 30), Harvest Moon: The Lost Valley and A-Train: City Simulator while the PS Vita had Minecraft (co-op included), Tales of Hearts R, Hotline Miami 2: Wrong Number and Guns Up!, a free side scrolling action game. Upcoming PC exclusives include Dreadnought has futuristic aerial armada action with competitive multiplayer gameplay and a rogue mercenary villain. If you had to pick five of these E3 2014 featured games (let’s say you have every console), which ones would you get?